Home > Health Care, Food, Beer, Retail, Tobacco > Food, Beer and Beverage A-I > General Mills, Inc. Beautifully engraved SCARCE SPECIMEN certificate from the General Mills, Inc. This historic document was printed by the American Banknote Company around 1960 and has an ornate border around it with a vignette of allegorical men around the company logo. This item has the printed signatures of the Company’s President and Secretary. General Mills is one of the world’s leading consumer packaged foods companies. It generates more than $7.5 billion in revenue annually and produces many well-known products including Cheerios and Wheaties cereal, Gold Medal flour, and Betty Crocker snacks and mixes. 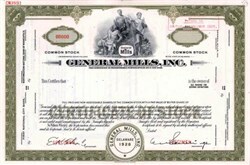 Founded in 1928, General Mills was founded in 1928.